Teachers read the following information to your students. Then, write the board work on the board and ask your students to perform the requested actions. This will increase their understanding of the difference between similes and metaphors. A simile is a phrase or word that describes one thing as similar to another, often unrelated thing. An example is "Jane went up the stairs as quiet as a mouse." Similes use the words "like" and/ or "as". A metaphor is a phrase or word that states that one thing is another, often unrelated thing. An example is " Tom is a rat." Teachers, write this paragraph on the board. After each sentence ask the class if the sentence is a simile or a metaphor. Ask students to explain why they chose either answer. Point out the key words that let you know if the sentence is a simile or a metaphor. When the board work is complete, pass out and ask the students to do the worksheet included with this lesson plan. At the end of the worksheet, students are asked to come up with their own similes and metaphors. 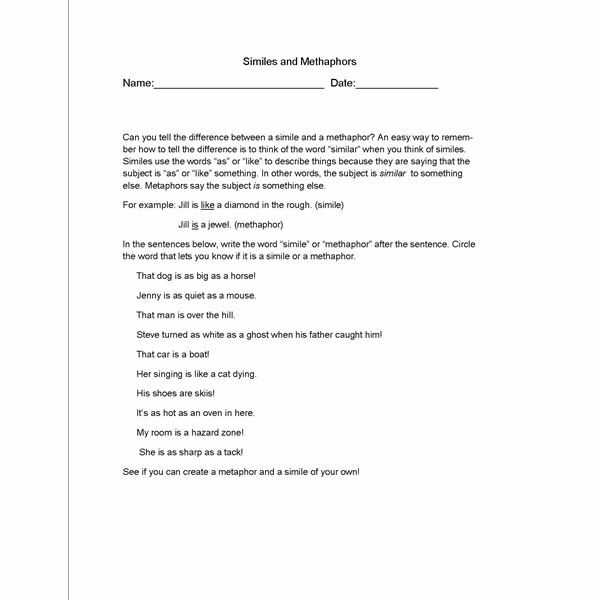 Assist students in coming up with their own similes and metaphors. Write the following paragraph on the board. In the paragraph, have the students underline the metaphors and circle the similes. Sherry went to Joe’s party that was a disaster. When she got there, she entered the room quiet as a mouse. Sherry turned white as a ghost when she saw what was going on. The kids were small tornadoes that destroyed the room. Sherry knew right then that Joe’s mom was going to be a fireball when she saw the mess. The living room was now a junkyard and the kitchen was a science lab. Sherry decided to be a tree and leave! Remind students that metaphors use past, present and future forms of "is" as opposed to similes that use words such as "like" or "as". Similes can also be remembered by remembering the word "similar", which is different than "same". review the paragraph with students to be sure they understand the difference between similes and metaphors. Discuss some commonly used metaphors with the class. Throughout the day, be sure to use similes and metaphors periodically and ask the students to do the same! Read on in this series for fun activities using similes and metaphors.